SILVER SPRING, Md., March 19, 2019 /3BL Media/ — In celebration of the International Day of Happiness, LG Electronics USA and Discovery Education, the leading provider of standards-aligned digital curriculum resources, engaging content, and professional learning for K-12 classrooms, today announced the International Day of Happiness Day of Learning – a nationwide, day-long conversation designed to create meaningful dialogue around the importance of happiness and deliver new resources and tips for practicing happiness skills with teachers, students and families. 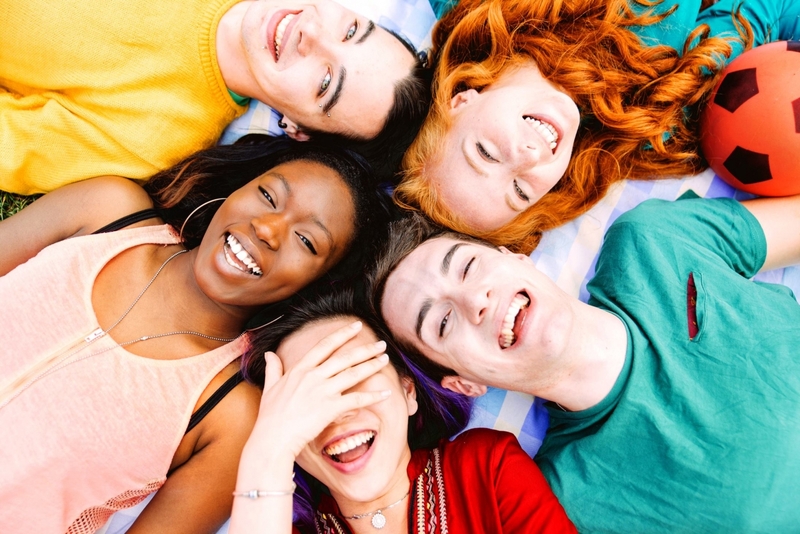 On March 20, 2019, educators are invited to share videos or pictures of how they are celebrating the International Day of Happiness. Students are also invited to share videos by joining a special Twitter chat with @LGUS and @DiscoveryEd to answer the question: “which happiness skill are you practicing and how has it impacted your life, your classroom or your school?” Participants are welcomed to use #DiscoverYourHappy and #ExperienceHappiness to follow the conversation. and within Discovery Education Streaming Plus. An award-winning comprehensive digital service supplementing instruction across all K-12 curricular areas, Discovery Education Streaming Plus helps build the important critical thinking, collaboration and communication skills needed for success beyond graduation. The United Nations International Day of Happiness is a global celebration to recognize happiness as a fundamental human goal that lays the foundation for the well-being of people worldwide. The Day of Learning will enlighten students and educators across the country about the Six Sustainable Happiness Skills: Mindfulness, Positive Outlook, Purpose, Gratitude, Generosity, and Human Connection, provided by happiness experts from The Greater Good Science Center at the University of California, Berkeley, Inner Explorer and Project Happiness. During the Day of Learning experts will demonstrate how happiness impacts our physiology and psychology. According to the U.S. Centers for Disease Control, suicide is the second leading cause of death for adolescents age 12-17 in the United States. Research from the Anxiety and Depression Association of America shows that one in four children are affected by anxiety disorders; these youth are at higher risk to perform poorly in school, miss out on important social experiences and engage in substance abuse. Happy people are healthier, live longer, earn more money, and do better in school and life. 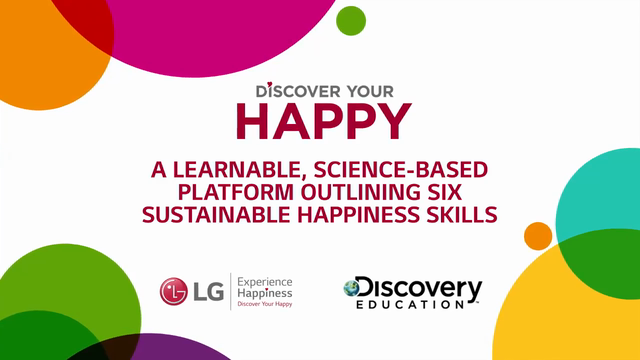 Launched in 2018, Discovery Education and LG Electronics USA joined forces to create the Discover Your Happy program, an initiative designed to teach students that happiness is a learnable skill, as an extension of LG’s Life’s Good: Experience Happiness corporate social responsibility initiative. Discover Your Happy introduces skills and practices aimed at achieving sustainable happiness. These classroom tools are aligned with curriculum standards and are designed to provide engaging, hands-on activities for students to identify actionable ways to start their journey toward sustainable happiness, while bringing happiness to their communities through the Six Sustainable Happiness skills. Discover Your Happy resources are accessible for free online and also through Discovery Education Streaming Plus. For more information about Discovery Education’s digital curriculum content and professional development services, visit discoveryeducation.com. Stay connected with Discovery Education through social media on Facebook, Twitter, Instagram and Pinterest @DiscoveryEd. Aiming to enrich the lives of 5.5 million youth in the United States over the next five years, LG Electronics USA has launched a unique new corporate social responsibility initiative called Life’s Good: Experience Happiness. Happiness skills can be learned, according to the Greater Good Science Center at University of California Berkeley, which has identified six skills that sustain one’s ability to recognize that life’s good: Mindfulness, Human Connection, Positive Outlook, Purpose, Generosity and Gratitude. LG’s science-based platform is designed to engage leading non-profit partners such as Inner Explorer and Project Happiness who help equip American youth with the skills for sustainable happiness. Visit, LGExperienceHappiness.com. Discovery Education is the global leader in standards-aligned digital curriculum resources, engaging content, and professional learning for K-12 classrooms. Through its award-winning digital textbooks, multimedia resources, and the largest professional learning network of its kind, Discovery Education is transforming teaching and learning and improving academic achievement around the globe. Discovery Education’s services are available in approximately half of U.S. classrooms and primary schools in the U.K., and reach over 5 million educators and 51 million students in more than 90 countries. Inspired by the global media company Discovery, Inc., Discovery Education partners with districts, states, and like-minded organizations to empower teachers with customized solutions that support the success of all learners. Explore the future of education at DiscoveryEducation.com.